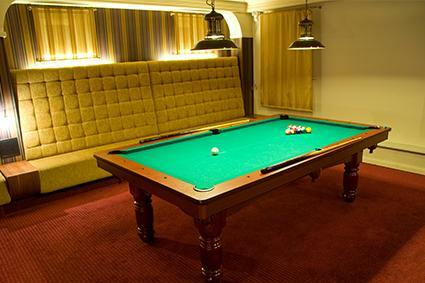 A finished basement takes a lot of planning, but is a great investment for your home. From building code issues to the final installation, learn the ins and outs of basement refinishing to determine the scope of the project you want to undertake. Before you begin your basement improvements, it helps to come up with a detailed plan of what you intend to do with the space. Taking the time to do this will help you find the right materials for the job, determine if permits are required and make the decision of whether or not you can tackle all the work yourself. A lot of factors and decisions you make will be affected by how you intend to use the space. A wet bar will require plumbing for example, while a basement playroom for the kids will not. Are you planning on adding a bathroom? If so, you'll need to worry about drains in addition to water intake and cosmetic looks. If you're making any major structural changes to the basement, such as adding or moving walls, adding plumbing or electricity, you will probably have to pull a permit at your town hall. When you do so, get a list of any building or plumbing codes in your area you will need to update or stay within as you work. Pulling a permit does mean your finished job will be inspected, so plan on hiring an expert if necessary. If you fail to pull a permit for the renovation, keep in mind that this could turn up when you plan on selling the house and could result in problems down the road. Obviously how you intend to use the space will dictate what type of materials you will ultimately use. Keep in mind during your planning phase, however, that things like drywall are not suitable for below grade installation. Obviously, one of the most serious issues regarding a finished basement is whether it is waterproofed. Even if you don't have leaks in a basement, areas below grade are prone to high humidity and moisture levels. Even using materials meant for basements will still require you to do some sealing and waterproofing. Plan on installing vapor barriers throughout the basement. A vapor barrier is typically a layer of plastic or another waterproof material installed beneath the finishing materials. This will include hanging a vapor barrier over the interiors of your existing basement walls beneath any finish wall material. Depending on what you intend to install on the floor, you may need to roll out a vapor barrier over the concrete as well; engineered hardwood and carpeting both require a vapor barrier, while porcelain flooring does not. In addition to vapor barriers, be prepared to seek out and fill any cracks in the concrete on the walls and floor of the basement. If you plan on painting or installing tile over the concrete, you should also plan on sealing it. Sealing concrete takes place after the concrete has had time to cure; factor this time in if you need to pour new concrete or if you have an existing dirt floor. Even if you don't live in an area prone to floods, it's a good idea to install a sump pump if you plan on finishing your basement. Once water finds a way to enter, it will enter again, no matter how many years went by before the first occurrence. A good sump pump installation will direct water around the home to one area, then pump it out if it enters. It only takes one flood to ruin your entire basement, so plan on installing one. Planning the layout of your basement is a lot like planning the layout of any other room in your home. Some things, like placement of outlets, will be determined by current building codes. Other things, such as whether to install built-in shelving, are up to you. 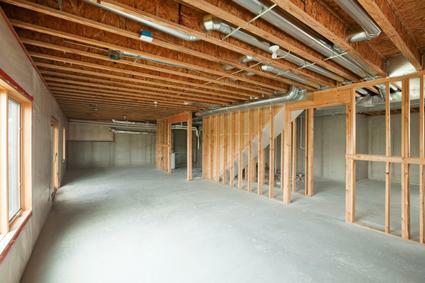 Plan on shutting off the utility section of your basement from the finished section. Install the sump pump here to avoid having a pit in the middle of the room. Make use of the area beneath the stairs of the basement by installing closets, storage compartments or a wet bar depending upon height. Make the most of any natural light and windows in the space by keeping the main area open, rather than turning it into several small rooms. Boxing off a room may deprive it of any natural light, making it feel small. Decide what you want to do with the ceiling. If you drop a ceiling low enough to conceal all pipes and wires, make sure people can stand comfortably beneath it. Otherwise, consider ways to decorate the exposed pipes or exhaust vents that are too low to enclose in ceiling so they become part of the overall scheme. If your existing walls are in good shape, it's possible to seal and paint them while leaving them intact. If you plan on adding outlets, lights and plumbing, however, you'll need to finish them. You have a couple of options for how you proceed here. Once you've installed a vapor barrier over the existing concrete walls, it is possible to build some stud walls to go over them. You'll need to construct frames of 2x4's with the studs running every 16-inches. Once the stud walls are in place, screw cement backerboard over them. Don't use greenboard or drywall; even with a vapor barrier there may be too much moisture to prevent mold or other problems. Instead, use a backerboard you can paint, tape the seams and finish the walls as if they were drywall. Owens Corning: Owens Corning makes a basement refinishing system that relies on their breathable fiberglass insulation so your basement will stay drier and less humid. Their finished walls appear like drywall, without visible framing. Wahoo Walls: Wahoo Walls are made of an inorganic material that does not harbor mold and does not swell when it comes in contact with water. These panels are fairly simple for homeowners to put up themselves as well. ZenWall: ZenWall is a basement finishing system made up of interlocking panels. The panels are made of fiberglass and are not affected by water or moisture. The panels have a washable vinyl finish to help them stay looking great. No matter what type of flooring you install in your basement, make sure the concrete is cured and sealed before you begin. Avoid materials like laminate that swell when they come in contact with moisture, or you could end up with a floor that rolls and humps after just a few months. If you plan on installing anything other than carpet on the concrete, take the time to level the floor before installation. 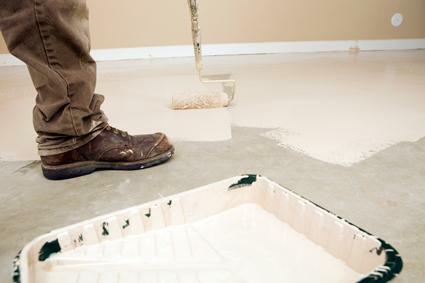 A self-leveling floor compound is the fastest and easiest way to do this; pour the compound on the concrete and let it seek out the high and low spots, leveling it for you. Put down a vapor barrier on top of the compound once it's dry and install your choice of flooring. A good basement remodel can add a lot of value to your home. Refinish your basement and see just how much use you can get out of this previously unwelcoming space.